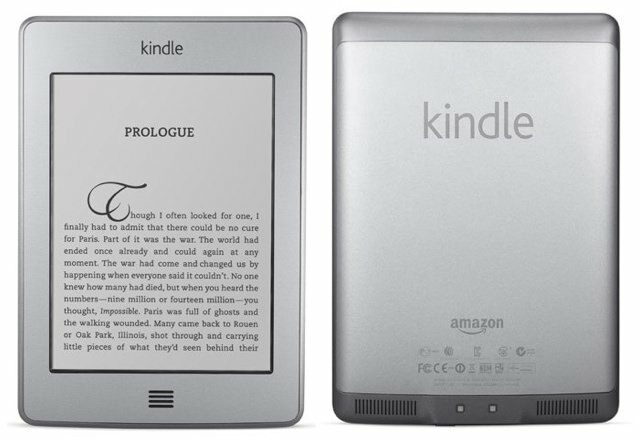 This is a used in excellent condition Kindle Touch with Special Offers. Includes Kindle only. The most elegant feature of a physical book is that it disappears while you're reading. Immersed in the author's world and ideas, you don't notice a book's glue, the stitching, or ink. Our top design objective is to make Kindle Touch disappear — just like a physical book — so you can get lost in your reading, not the technology. Kindle Touch is easy to hold and read. We designed it with long-form reading in mind. When reading for long periods of time, people naturally shift positions and often like to read with one hand. Kindle Touch has a new ergonomic design so it can be held comfortably however you choose to read. Kindle Touch features a full touchscreen display that puts page turns, navigation and note-taking at your fingertips. Tap unknown words to call up definitions in the dictionary, highlight sections of text to send to a friend, or search, shop and type with a virtual keyboard that appears on screen just when you need it and provides suggestions automatically as you type. Amazon invented a new type of touch experience that eliminates the fatigue caused by continuously swiping to turn the page, and that allows readers to hold Kindle with either hand while still turning pages comfortably. With EasyReach, Kindle Touch users can effortlessly page forward in a book or a periodical while holding the device with either hand. Tapping on most of the screen area will page forward, the most common action done when reading; tapping in a narrow area near the left edge of the device turns to the previous page; and tapping on the top part of the screen brings up the toolbars for further options. This is another way that Kindle helps readers get lost in the author's world. Unlike a laptop, Kindle Touch never gets hot so you can read comfortably as long as you like.